Receiving good feedback for the Hike app, the messenger has now been updated taking the messenger to the next level. The messenger app is now upgraded to a social messenger app. In the Hike version 2, a lot of new features have been added which improves the social aspect of the instant messaging app. 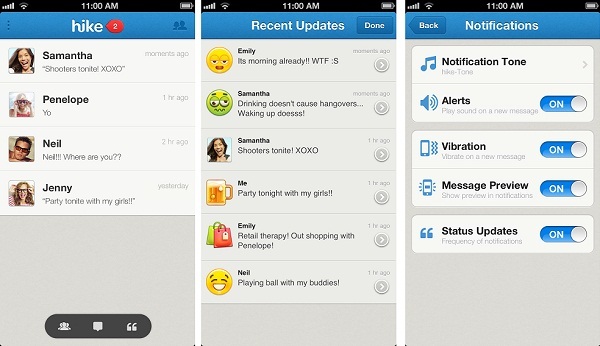 The new Hike features Status Updates with Moods which express your feelings to your Hike friends. In the updated Hike, you can add Moods, which describe your feeling to the Status Update, thus personalizing the updates. There are moods for various activities like Studying, Sleeping and Shopping etc. More moods will be soon added. The Status updates along with the moods can be seen only by your Circle of Friends, thus protecting your privacy. The updates can be further shared to your social networks. There is also a new Recent Updates tab which shows the activities of your friends. And if you are troubled by the constant Notifications, you can now easily turn them off. You can download the Hike 2.0 app for Android, iOS and Windows Phone 8.